This entry was posted in Uncategorized and tagged Bangkok, culture, Krungthep, precipitation, rain, Thailand, weather by christao408. Bookmark the permalink. nice picts..i love the rain! here on the pacific west coast, it’s cool when it rains. Must be uncomfortable and humid when it rains where you are at? Wow great photos of a bad season for you. I know the humidity here when it rains and can begin to imagine what it is like for you. I take some of your rain and give you some of my haze. Fair deal? Rain is good, but not so great all the time. It would put me in a bad mood being around so much. does it drive you crazy? I don’t think I could live with that much rain and gloomy looking.well, here in Texas we keep our a/c on from April to Oct. and that’s because of the humidity but my brother said it’s humid over there,too. You walk around with clothes wet and clinging to you for how many months? I’ve been to Bangkok twice now, but we purposely avoided rainy season. Right now, in Florida, we are in hurricane season. Our part of Florida currently is in a pattern of getting about a 10 minutes rain shower in the early afternoon every day. I kind of like it. @straw_hut – grew up in Silicon Valley so can def relate to that equating rain with cool weather. 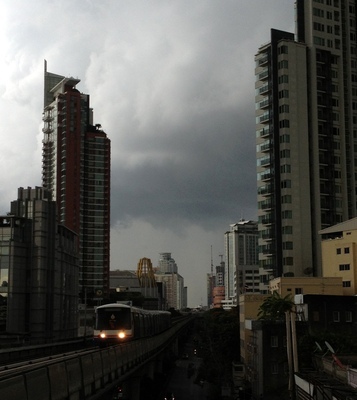 Every time I step outside here in Bangkok during the rain, I am immediately shocked back into my muggy reality! I guess it’s too hot to wear a waterproof / repellent raincoat. But an umbrella doesn’t seem to be up to snuff with these brief but intense rain. What do most people do if you have to get around? I didn’t know which Mini to give so since you are not showing food I will share a cartoon cupcake. 🙂 HA!We have had some major rain storms all week and today the sun came out for the weekend. As far as I am concerned it can continue to rain all week and be dry for weekends. I like the rain too to keep things cooler and water my outside plants so I don’t have to. :)I guess it would be tacky to tell you to keep dry. 😛 HA! That’s a great capture of what heavy rain looks like. I WISH we could get some rainstorms. Ohhh yay – 2 day stop-over in Bangkok on the way to Europe in late August and then a week on our return in October….. Something to look forward to ;)We’re also doing a week in Hua Hin – hopefully the rain won’t be so bad there during the wet season. As long as the rain goes away as quickly as it came, I don’t mind a shower each day like that. If it lasts a while, it can get depressing! But we can definitely use more than the 6″ total we had this year (July to now!)!!! Would suit me. If it’s going to rain, I like it to REALLY rain. @Inciteful – And it surely does! @slmret – This is more Hawai’i style rain than dreary California winter rain. @venice – It seems that Hua Hin is one of the drier areas along the gulf, so you should be in pretty good shape for your visit. @whyzat – Am willing to share! @Ikwa – Not tacky at all… just hard for me to accomplish! Ha! @ElusiveWords – You just shelter in place, generally. If you put any type of rain gear on (even a light plastic poncho) you end up sweating too much, resulting in being just as wet as if you had walked in the rain unprotected. @Pepin909 – On the days when our rain limits itself to brief showers, I’m quite happy with it. The days when we have an hour of torrential rain, flooding the street I live on, I’m not so happy. @Texasjillcarmel – Humidity is a year-round feature here. You learn to modify your habits, though, to cope: walk slower, choose routes that are indoors and air conditioned, give yourself time to cool down in front of the a/c unit after showering and before heading outdoors. These tricks can help make it more bearable. 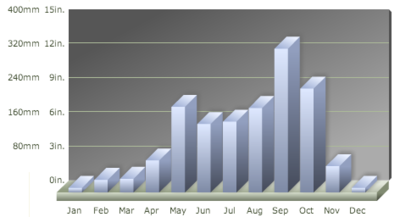 @armnatmom – Thankfully, our rain isn’t weeks and weeks of dreary overcast. Instead, we start with sunny skies, build some tremendously dark clouds, have the rain, and then are done with it for the day. @beowulf222 – Oh, I wish I could send you some rain to clear your air. Other friends down there have been posting pictures and it looks like Beijing! @Fatcat723 – Probably quite similar to your humidity, I would guess. Great pictures Chris. I kind of miss that kind of rain. Heavy, steamy, evoking fragrance from the earth. @christao408 – Aha! Hawai’i rain is good rain! I can handle that sort of rain! we know humidity in Texas,too. This was well written – quite scientific-like, in terms of information. It also reminds me of what you said to me before my trip to Thailand. I was concerned about the monsoons and then you said how rains are often short and I could still enjoy my time during the monsoon season – you were right! 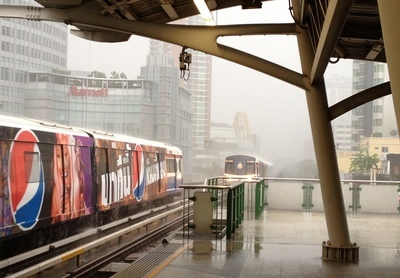 i had no idea that it rains that much in bangkok.